It’s a tale of two housing markets in the Toronto area as Canada’s biggest city gears up for the crucial spring selling season: sales of big detached homes are slow, while condo deals are booming. On one side are people like Karen Berends, who put her $1,498,888 house back on the market in nearby Oakville this month after two failed attempts to sell in the past year. She reduced her asking price by about $51,000, but still there are no takers, and she’s kicking herself for not cashing out last spring when the market was in a frenzy. Then there’s Beth O’Donoghue, a sales representative at Brad J. Lamb Realty Inc., who says the market is as hot as it’s ever been. Her clients recently lost out in three separate condo bidding wars in a week, including one with 11 offers. That’s convinced O’Donoghue, who’s invested in four new condos herself in the city in the past four years, to hold onto her assets for now. One she bought in pre-construction for $420,000 and figures she could sell for close to $700,000. “If you would have told me three years ago when I bought this place that I would’ve made this much money on it already, I would have said you’re crazy,” she said. After a decade as one of the world’s hottest housing markets, Toronto is moving in two directions. Transactions have certainly cooled since May as the government introduced new rules to tame runaway prices. But the impact has been largely on big, expensive detached homes, with sales plunging 41 per cent in February from a year earlier, and prices dropping 12 per cent since hitting a record last year. Condo prices, in contrast, soared about 20 per cent since last February. The deviation is largely as a result of mortgage regulations that went into effect on Jan. 1 as well as rising interest rates. The rule requires that even people with a 20 per cent down payment, who don’t require mortgage insurance, prove they can make payments at least 2 percentage points above the rates under which they go into contract. That’s pushing buyers out of the detached segment and right into the condo market. Real estate agents and economists expect some stabilization in the detached market as the spring selling season swings into full gear, but the price spikes of last year are probably history. 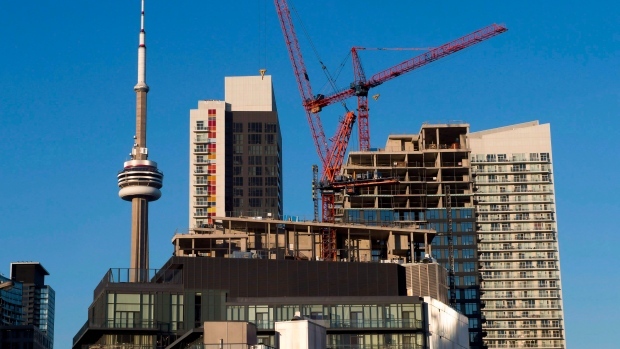 The condo market is likely to keep chugging, bolstered by millennials in high-paying technology and financial jobs, strong immigration and pinched supply, according to Bank of Montreal economists. “Spring will probably take a little more time to get going than years past, but there’s so much demand in the marketplace as Toronto continues to attract people around the country and the globe,” said Christopher Alexander, regional director at real estate firm Re/Max Integra. Meanwhile, things are getting tough for tenants too. The combination of stress tests, urbanization and high home prices is creating the perfect formula for skyrocketing rents, said Simeon Papailias, co-founder of the Real Estate Center, a Toronto-based real estate management company. Many homebuyers who no longer qualify for a mortgage are turning to renting instead, which in turn attracts investors who want to become landlords. “This market is creating new monsters -- it’s taking a life of its own and it’s creating a new marketplace,” Papailias said by phone. Berends, the Oakville homeowner, has placed ads in several Chinese media outlets in hopes of attracting foreign shoppers. “Apparently there are still buyers in mainland China, but they’re not really jumping,” she said. She’s hoping to retire to a home she’s building north of the city in a few years, but she’s waiting for the right price for her existing house.